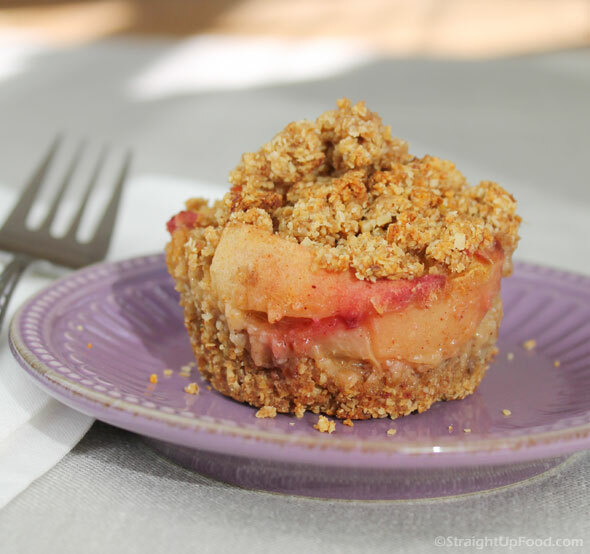 These single-serving peach pies (“pie-lets”) are delicious and very cute, ideal for a special end to any meal. You don’t need butter, shortening, sugar, salt, or white flour for this delicious crust, which makes them quicker and easier to make. Forget that traditional pie crust and watch how these disappear! I found this lovely idea on one of my favorite foodie sites, Straight Up Food (www.straightupfood.com). This site’s author, Cathy Fisher, is a chef, teacher, and cookbook author (Straight Up Food: Healthy Eating You Can Live With). And this superb dessert is typical of how she does things—few fats, no sugar, minimum salt, and no white flour. For those of you Cook’n cooks and readers who are looking for healthy foods that actually taste good, aren’t complicated to make, and don’t break the bank (ingredients-wise), her recipes might be your answer. 1. To start fruit sauce, place water (or juice), dates, and lemon juice into blender; set aside. 2. 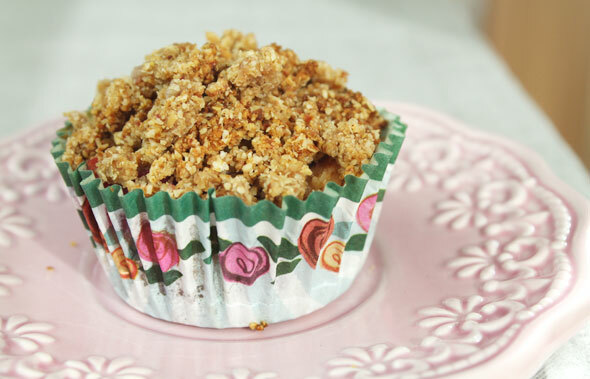 Line a standard 12-cup muffin tray with paper cupcake liners. For the fruit, place the twice-sliced peaches into a medium bowl and toss with the 1 tablespoon of lemon juice. To start the crust/topping, grind the 1½ cups of rolled oats (for the crust) and ¼ cup of rolled oats (for the fruit sauce) together in a food processor until it resembles flour (about 30 seconds). Remove ¼ cup of the flour from the food processor, and set it aside (to be used later in the fruit sauce). To finish the crust/topping, add the pecans and cinnamon to the food processor of oat flour, and process until the texture resembles coarse flour. Add the chopped dates, and process for about 1 minute, or until the mixture just begins to clump together. Add the milk and process until the mixture starts to ball up into dough (this will happen quickly). Transfer to a medium bowl and set aside. To finish the fruit sauce, blend the water (or juice), dates, and lemon juice until smooth. Add the ¼ cup of oat flour that you had set aside, and the cinnamon, and blend again until smooth. Pour this into the bowl of peaches, and stir. Preheat the oven to 350°F. Now you should have two bowls in front of you: one with the peaches and sauce, and one with the crust/topping. Place 1 about tablespoon of crust dough into the bottom of each lined muffin pan. Then press down on each bit of crust with the back of the tablespoon measure, to pack it down (going up the sides a little is desirable). You will have about ¾ cup leftover crust; save this. Spoon the peaches evenly into each muffin well (on top of the crust). Spoon it the first time around then place the last pieces by hand to assure that they are laying down and fitted nicely in the space (you don’t want a lot of empty space in there). Spoon any leftover sauce over the tops. These should reach about ¾ the way to the top of the muffin paper. Using the leftover crust dough, place about 1 tablespoon on top of each, like a crumble topping; lightly press down with your fingers (so none rolls off). Bake for 25 minutes, or until the tops are medium brown (don’t over-brown). Set aside to cool. Wait at least 15 minutes before serving (these will firm up the longer they cool). You can see how easy it would be to adapt this recipe to any fruit you have on hand (canned or fresh). For instance, we have loads of rhubarb and strawberries right now, so I’m going to substitute them for the peaches. I’ll let you know how this works. 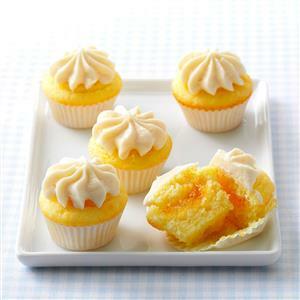 Meanwhile, the idea of mini desserts is so intriguing that it ought to be explored further. Lots of sites have jumped on this theme. On Taste of Home the cooks used phyllo pieces as mini crusts to hold all sorts of fillings. 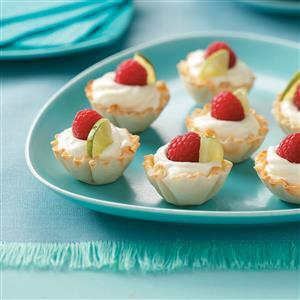 Continuing the phyllo-as-crust theme, these clever cooks created Key Lime Mousse Cups. You can see that this idea would work with any filling. Why not banana or coconut cream? Or chocolate, vanilla, or butterscotch puddings? This is limited only by imagination! They also lined a mini pan with a favorite chocolate chip cookie dough, creating a well in each. After baking the cookie dough, they filled these with melted caramel, pecans, and topped with melted chocolate chips. The end result? 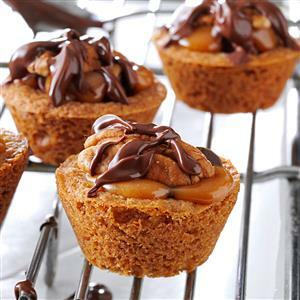 Mini Turtle Cookie Cups. The common thread through all the Taste of Home ideas is the mini baking pan. Any kitchen specialty store sells them, as does amazon.com. It even lends itself to mini cupcakes and mini muffins. Once you have the right pan, let your creativity flow. 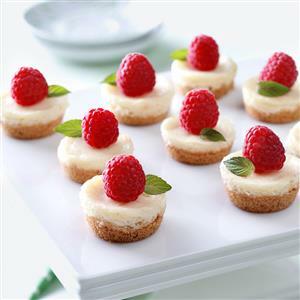 For instance, why buy preservative- and chemical-loaded mini cheesecakes at your Costco or Sam’s Club, when you can make your own healthy version at home? 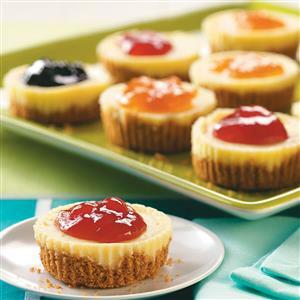 Just bake a cookie crust base, top with some no-bake cheesecake filling, and garnish with a pretty fruit, as the photo shows. Much prettier and tastier! Or use a graham cracker crumb crust and a baked cheesecake filling if you prefer. Then you might top each one with different flavors of jam or jelly, as this photo shows. Again, you’re limited only by your imagination. So why bother with going to all the work of making many mini this-es and that’s, when making large versions could suffice? First, minis travel well (so they are perfect for picnics, cookouts, camping, etc.). Second, they make a pretty presentation (presentation is a sign of an accomplished cook). 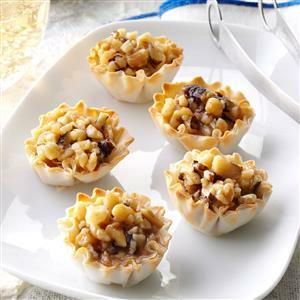 And third, they’re convenient for your crowd (eating small things out of hand can be much easier than juggling a paper plate). So when it’s potluck, picnic, or party time, think MINI!